Watch as Samantha Gladish from Holistic Wellness demonstrates how to make her great tasting vanilla almond milk recipe. This nutrition-dense recipe is derived mostly from almonds and water. Almonds are among the healthiest nuts in the world. They have been long touted for their nutritional excellence. The nutritional content of almonds can be extracted through either a grinding or juicing process as seen here. The end product is almond milk—a healthy alternative to cow’s milk. 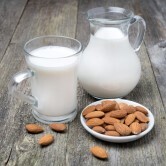 Almond milk has a lot of health benefits. It has a high nutritional content, is low in calories and is an excellent food to consume if you are concerned about managing your weight.